If you’re in desperate need of a plastic bonsai tree, a sock with Michael Jackson’s face on it, a Thai-speaking calculator, a six-foot-tall plastic thermometer or a wholesale supply of Vietnamese spring roll wrappers, then Indochine Market is your place. 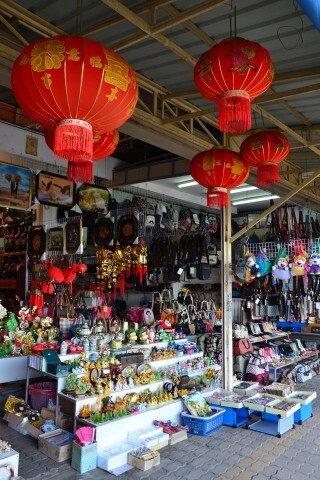 The market is mostly filled with junk, but you can score quality Lao coffee and tea along with handmade baskets, Lao silk, folk instruments, old military uniforms and dragon-headed walking canes. Loads of Asian-made cookware can be found in the many shops that line the roads across from the market for half of what you’d pay in Bangkok. Even if you’re not a shopper, the market and its surrounds help to create a very colourful scene amid the larger riverfront area. The market proper is located directly beneath a large portion of the riverfront promenade and can be accessed by several entrances. It’s open daily from early morning until around 16:00.